Location: Available in and/or around most Tanzanian parks. After several days in a safari vehicle, most people find it quite refreshing to get out for a walk even if only for an hour or so. A variety of different walking safaris (many more than what are listed here) are available and can be adjusted to match your interest. At Lake Manyara you can enjoy a short stroll on the edge of the Great Rift Valley with beautiful views of the lake and the National Park below or you can venture through the dense ground water forest viewing birds, monkeys, bush buck and other forest animals. At Ngorongoro Crater take a round trip hike, starting and finishing at the Serena reception. Enjoy a three-hour walk with a Masaai warrior and a guide and learn more about this culture and Ngorongoro wildlife. You can also choose an alternate one-hour stroll around the Serena Ngorongoro Safari Lodge. This hike is on a well-maintained trail with stunning views of the crater floor. 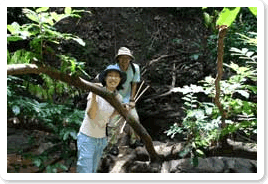 During this walk a guide explain interesting facts about nature. Or you can take a more rigorous daylong walk into Olmoti Crater. From the rim you will see several Maasai Bomas (villages) tucked away in different corners of the crater. Descend down into the crater and if you fancy, take a refreshing shower in the spectacular waterfall which pours through a notch in the rim, remember to pack a change of shorts.